It's not my recipe — no, no, no, I could never match the sheer subtlety of Marion Cunningham's pie. Her recipe both lightens and intensifies the pumpkin-ness of the pie, enhancing it with just a featherlight sprinkle of traditional spices. I don't bake and puree my own pumpkins, never fear, my testy pilgrims — or first colonists who really had the first Thanksgiving thirteen years before those religious fanatics in Massachusetts — you Virginians know who you are. I use Libby's or actually, an organic canned pumpkin instead. Cunningham's genius is to add just a mere cup and a half of that canned pumpkin as opposed to the full 15 ounces the recipe on the back of the 15 ounce can calls for (hmmm . . . ). You have about half-a-cup leftover, and so far I've found no use at all for it so you just throw it away. What! Yes, I still shudder and do it every Thanksgiving anyway. For the pie crust: here's a link to the only recipe for pie dough you need by Christopher Kimball of Cook's Illustrated. Preheat oven to 425 degrees. Make dough according to instructions. Roll dough into a 12-inch round on a floured surface and then transfer (ha!) to a 9-inch pie pan (not deep-dish). Trim edges, allowing a 1/2-inch overhang, then fold and crimp. 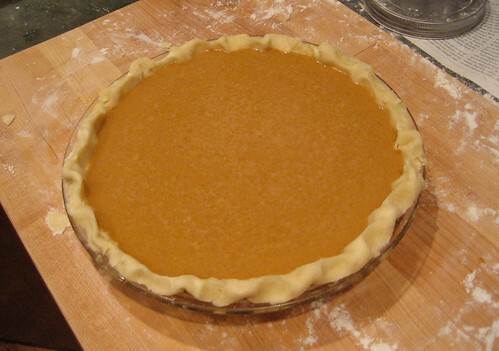 Fill and bake for 15 minutes, then reduce heat to 350 degrees and continue baking until filling is just set (as Cunningham reminds us, pumpkin pie is a custard), 30 to 40 minutes. Cool before serving. May be made two days ahead (that would be today). Maybe throw that 1/2 cup pumpkin into some muffins? You could probably freeze it and save it for later. So true, the spices used in one year's pie certainly shouldn't be used on the next. 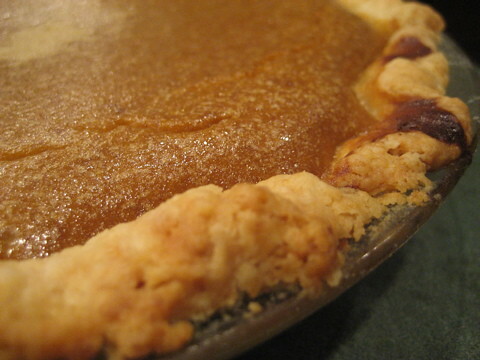 I firmly believe that to be the cause of most pie mediocrity. I am making this delicious pie again this year, Brandon! It is the best -- thanks so much for keeping it available for all of us. And I just threw out my old spices!